Mercury (Hg) is a global contaminant and human activities have increased atmospheric Hg concentrations 3- to 5-fold during the past 150 years. This increased release into the atmosphere has resulted in elevated loadings to aquatic habitats where biogeochemical processes promote the microbial conversion of inorganic Hg to methylmercury, the bioavailable form of Hg. The physicochemical properties of Hg and its complex environmental cycle have resulted in some of the most remote and protected areas of the world becoming contaminated with Hg concentrations that threaten ecosystem and human health. The national park network in the United States is comprised of some of the most pristine and sensitive wilderness in North America. There is concern that via global distribution, Hg contamination could threaten the ecological integrity of aquatic communities in the parks and the wildlife that depends on them. In this study, we examined Hg concentrations in non-migratory freshwater fish in 86 sites across 21 national parks in the Western United States. We report Hg concentrations of more than 1,400 fish collected in waters extending over a 4,000 kilometer distance, from Alaska to the arid Southwest. Across all parks, sites, and species, fish total Hg (THg) concentrations ranged from 9.9 to 1,109 nanograms per gram wet weight (ng/g ww) with a mean of 77.7 ng/g ww. We found substantial variation in fish THg concentrations among and within parks, suggesting that patterns of Hg risk are driven by processes occurring at a combination of scales. Additionally, variation (up to 20-fold) in site-specific fish THg concentrations within individual parks suggests that more intensive sampling in some parks will be required to effectively characterize Hg contamination in western national parks. Across all fish sampled, only 5 percent had THg concentrations exceeding a benchmark (200 ng/g ww) associated with toxic responses within the fish themselves. However, Hg concentrations in 35 percent of fish sampled were above a benchmark for risk to highly sensitive avian consumers (90 ng/g ww), and THg concentrations in 68 percent of fish sampled were above exposure levels recommended by the Great Lakes Advisory Group (50 ng/g ww) for unlimited consumption by humans. Of the fish assessed for risk to human consumers (that is, species that are large enough to be consumed by recreational or subsistence anglers), only one individual fish from Yosemite National Park had a muscle Hg concentration exceeding the benchmark (950 ng/g ww) at which no human consumption is advised. Zion, Capital Reef, Wrangell-St. Elias, and Lake Clark National Parks all contained sites in which most fish exceeded benchmarks for the protection of human and wildlife health. This finding is particularly concerning in Zion and Capitol Reef National Parks because the fish from these parks were speckled dace, a small, invertebrate-feeding species, yet their Hg concentrations were as high or higher than those in the largest, long-lived predatory species, such as lake trout. Future targeted research and monitoring across park habitats would help identify patterns of Hg distribution across the landscape and facilitate management decisions aimed at reducing the ecological risk posed by Hg contamination in sensitive ecosystems protected by the National Park Service. 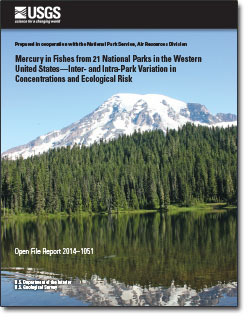 Eagles-Smith, C.A., Willacker, J.J., and Flanagan Pritz, C.M., 2014, Mercury in fishes from 21 national parks in the Western United States—Inter and intra-park variation in concentrations and ecological risk: U.S. Geological Survey Open-File Report 2014-1051, 54 p. https://dx.doi.org/10.3133/ofr20141051.